S2L Color Scroll displays moving colors based on incoming audio. ▪ Colors - Opens the Color Table to specify the colors. The default colors are White, Black. ▪ BPM - Defines the speed. The default value is 600. Valid values range from 0 to 9999. ▪ Step Width - Defines the number of pixels the effect should scroll in the direction per frame [in %]. The default value is 0.01. Valid values range from 0.01 to 100. ▪ Color Width - Defines the width of a single color [in %]. The default value is 10. Valid values range from 0.01 to 100. ▪ Cross Width - Is only available for Cross Mode [»Using Directions]. Defines the size of crossing colors [in %]. The default value is 50. Valid values range from 0.01 to 100. ▪ Amplification - Amplifies the audio input and as a result increases the visual intensity [in %]. The default value is 0. Valid values range from 0 to 100. ▪ Displacement - Defines the amount of distortion. The default value is 0. Valid values range from 0 to 100. Cross Mode Axes- Is only available for Cross Mode. Allows you to choose to which axis Cross Mode applies [Axes 1 And 2, Axis 1, or Axis 2]. The default mode is Axes 1 And 2. Displacement Speed - Is only available for Displacement. 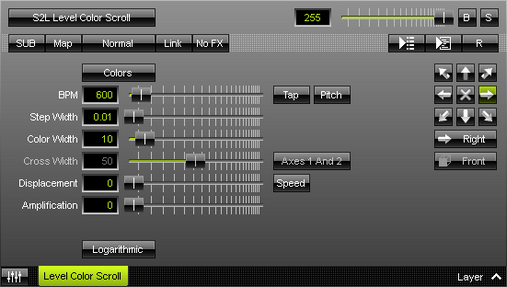 Allows you to choose to speed in which the distortion affects the visuals. The default value is 10.0. Logarithmic - Displays the effect in a logarithmic way.